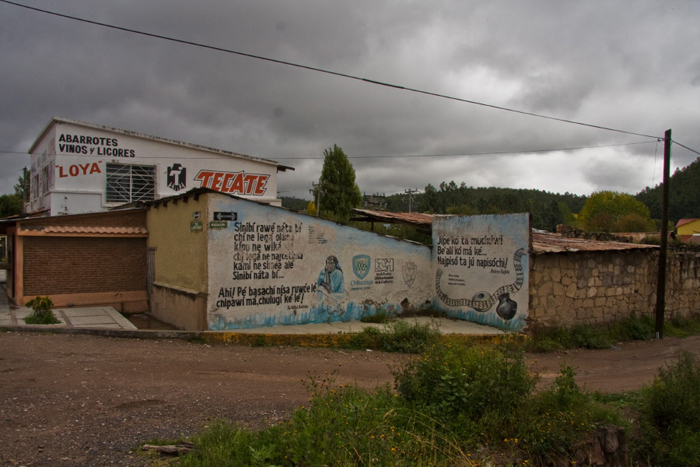 The ride down from Creel to Hidalgo de Parral was planned for today, but the remnants of the hurricane sauntered through late last night and this morning. But I am in no hurry, so I wasted the time away. In the afternoon the sky cleared up somewhat, so I walked through the town and out the other side, there is a small river, and it was turbulent and muddy after the rain. There were moments where it splattered over million year old rocks, swirling and splashing in beauty. But there were also moments where concrete scraps were abandoned in its flow and ugly plastic bags collected on their sharp edges. 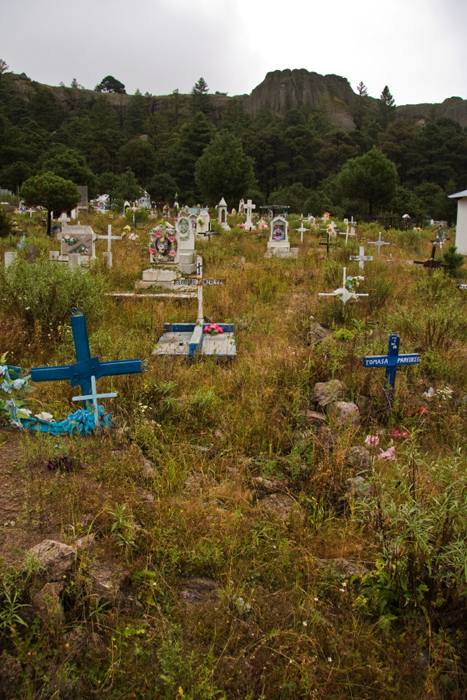 There was another cemetery like the one in San Ignacio de Arareko. 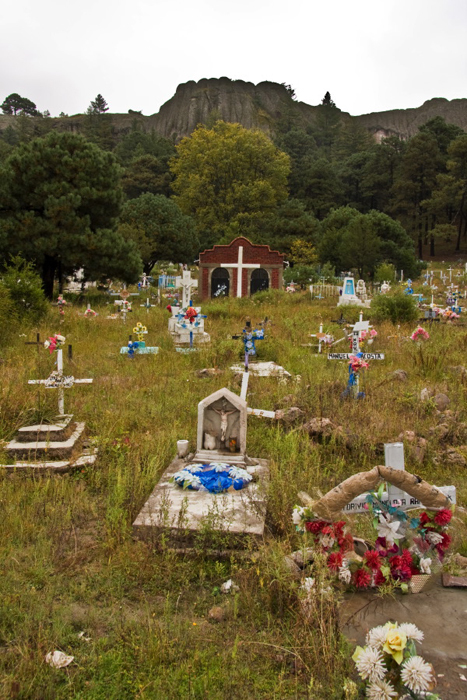 There were hundreds of small wooden crosses, some still standing, but most lying on the ground, piled upon one another. 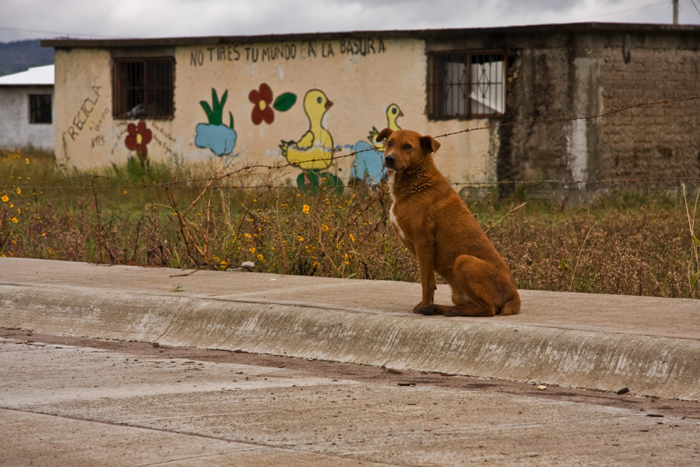 A stray dog enjoys the clean air after the morning shower. The turbulant clouds slowly heading east, away from town. Back through town and the taco shop was open. Wooden shacks, sitting by the side of the road, selling tacos and burritos have been my main food source for the past few days. 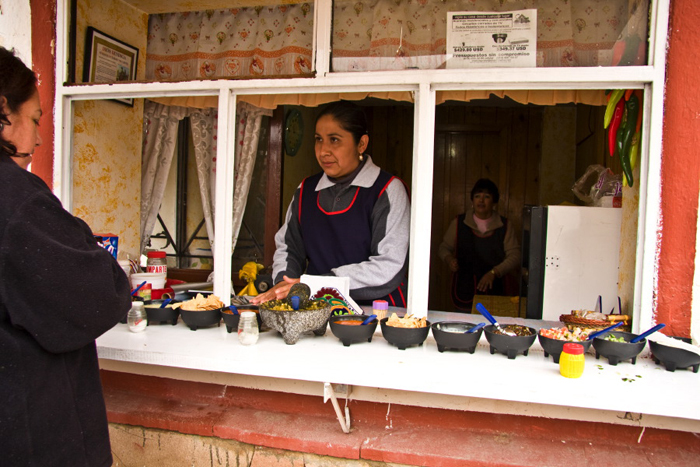 The wooden board covering the front opens up to reveal the counter and one or two ladies manning their stations. There is a choice of either a burrito, or a taco. Sometimes both, but not necessarily. A taco is on a five-inch soft tortilla, sitting on the flat tortilla is a line of meat of your choosing (pollo, carne, mole and at least five others which I have no idea what they are). A burrito is on a 10-inch tortilla, again with the meat of your choosing, but this time rolled up to about the size of a think cigar. Lining the edge of the counter are the condiments. Salsa (green and red), onion, cilantro, jalapeños, guacamole. The guacamole is nothing like it is in the states, it’s a light green color and a smooth puree, the consistency of thick milk. Tacos are seven pesos and burritos 13 pesos. I find myself ordering random things on the menu, sometimes it is wonderful, like the soup in Durango, which was filled with unknown meat and potatoes. And sometimes not, like when I ordered something, and out came French Fries.